Creative artists not only experience the world differently they also view the world differently. Picasso and Kandinsky, two of the well known creative geniuses of our time, both had disorders that forced them to perceive their world differently: could these disorders be one of the underlying factors that facilitated their genius? Stereopsis, the ability to have depth perception, is important for artists in order for them to paint the three-dimensional world realistically but new studies have shown that possibly many great artists did not have depth perception. Pablo Picasso, one of the many artists who had strabismus – abnormal alignment of the eyes – was able to create amazing pieces of art despite his inability to perceive depth. 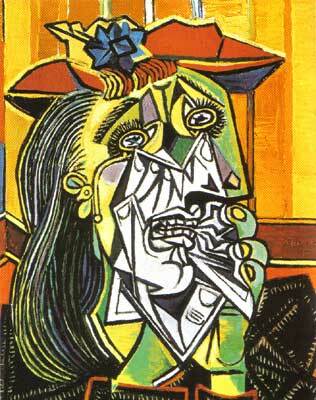 For him, this disorder made it easier for him to reproduce his two-dimensional representation of his subject matter. Margaret S. Livingstone and Bevil R. Conway state that “someone who cannot perceive depth from stereopsis may be more aware of—and therefore better able to capture—the other, monocular, cues to depth and distance, such as perspective, shading, and occlusion.” This can be seen in the painting on the left, Picasso’s The Old Guitarist where his shading skill and lack of depth perception is apparent. 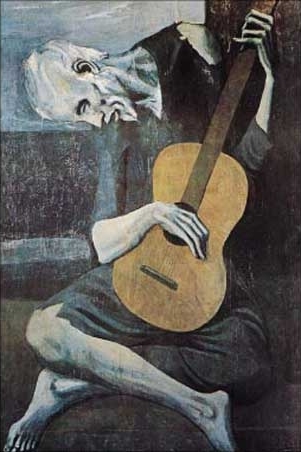 Picasso, is largely known for his cubist pieces, it is evident that going the route to cubism was ideal for his skill set due to his disorder. Synesthesia is a neurological disorder where activation of one sensory areas instantly activates another sensory area. 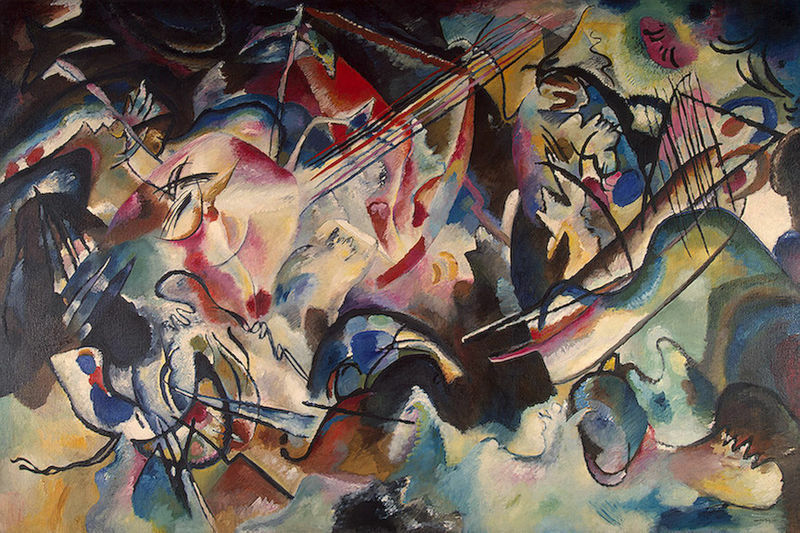 Wassily Kandinsky, for example, saw colors when he listened to music–when his auditory cortex was stimulated, his visual cortex was instantly stimulated. This cross wiring can make day to day activities hard–raindrops on an umbrella send flashes of color across ones visual field. But for artists, especially for Kandinsky, this disorder opened a wave of creativity. The piece reproduced below was made by Kandinsky while listening to a classical piece. It has been said that Kandinsky created a schema to represent the myriad tones and chords–yellow represented middle C on a trumpet, combinations of colors represented piano vibrational frequencies. The movement exhibited by his brushstrokes and the vivid color palette he uses make his pieces unbelievably beautiful. If it was not for his disorder this piece and all his other pieces would be drastically different. Nice post ! Interesting to know that not having stereopsis had some benefits as well. We Squint Specialists keep harping about the importance of stereopsis and leave no stone unturned to preserve it. I now feel not having stereopsis may not be such a handicap after-all.